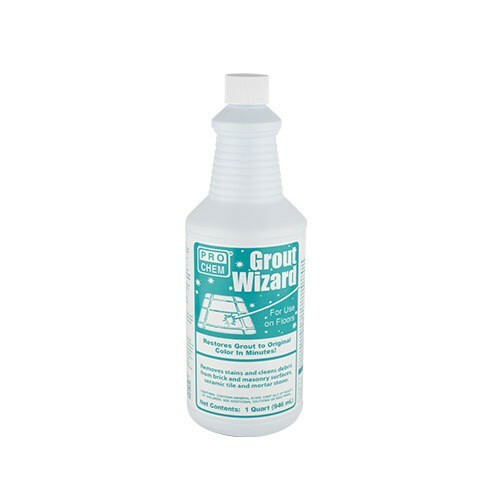 Grout Wizard | Pro Chem, Inc.
GROUT WIZARD is a rapidly effective, low odor, nonfuming, high sudsing, acid base detergent for a variety of cleaning and descaling operations, especially designed to make old grout like new again. This concentrated product may be used undiluted for severe encrustation of scale, deposits, alkaline matter or diluted with up to 6 parts water for economical removal of hard water formation of soap scum, corrosion, lime buildup or mortar spatters. This unique formulation combines the chemical strength of blended acids with the emulsification properties of high sudsing synthetic detergents. Cleans debris from brick and masonry surfaces, ceramic tile, mortar stone and metallic surfaces other than aluminum or magnesium. This product is ideal for cleaning, degreasing, and providing a light etch to concrete floors. Water conditioners assist in film-free rinsing of cleaned surface. Test product in an inconspicuous area on colored grout. Rinse and allow to dry. Make sure the product does not color the grout or damage the tile finish or surface. Check for dulling effect. May discolor or damage clothing, carpeting and baseboards. If grout has been sealed, it is recommended to remove the sealer with a strong stripper to prevent uneven cleaning results. Apply to a 2” x 2” area to grout seam only. Allow 2-3 minutes for products to penetrate. Agitate product over stubborn stains with a soft scrub brush or tooth brush. Do not allow product to splash on nearby surfaces. Rinse area thoroughly with clean water. If product is not rinsed thoroughly, grout residue may deposit on tile, causing a dull effect. Discard brush and sponge after use. A second application may be necessary. Do not use until dry. NOTE: Do not use this product if you have existing respiratory problems such as asthma or emphysema. Do not atomize (spray) this product, as it will create airborne fumes that should not be inhaled.